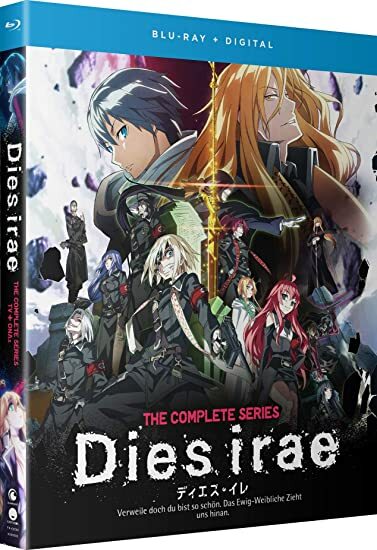 Dies irae: The Complete Series - BUY THIS BLU-RAY! The Longinus Dreizehn Orden has resurfaced in present-day Japan and, by sacrificing the souls of millions, seeks ultimate power. However, high school student Ren Fuji is poised to stop them. Armed with brutally efficient abilities similar to the LDO, and possessing an indomitable will to rescue his friends, he'll risk life and limb to save as many people as he can from a fate worse than death. If Ren wants to get to their leader, Lord Heydrich, killing lesser members on the hierarchical ladder is his best and only option. THEN SEND IN A COMMENT ABOUT YOUR FAVORITE FUNIMATION TITLE (you may click on artwork above for a refresher) PLUS YOUR NAME AND ADDRESS TO contests@efilmcritic.com or WeLoveHBS@aol.com. (Just one e-mail please.) Put [b]"NOBODY WANTS TO DIE IRAE" in the subject line and cross your fingers. We will draw names and one of the prizes could be yours. Only 1 entry per household.